But I am no wolf by blood. In February of 1961, three KGB agents came to Vasily Grossman’s flat. With all that Grossman knew about the workings of the Stalinist state, he would certainly have feared imminent arrest. He would not have anticipated, though, that the arrest would be not of himself but of his novel, Life and Fate. The agents demanded the manuscript and everything related to it, right down to the typewriter ribbons. As Robert Chandler tells us in the introduction to his translation of the novel, the “arrest of a book” instead of its author only happened one other time under the Soviet regime. And apart from Solzhenitsyn’s The Gulag Archipelago, no other work was deemed so dangerous by it. Luckily for the world the KGB was not entirely successful in its mission. Unbeknownst to its agents, there were two other copies of the manuscript in the care of friends and one of these was put on microfilm and smuggled out of the country in 1974. It was finally published in the U.S. in 1980, and in Russia in 1988 during the thaw that was Gorbachev’s Glasnost. 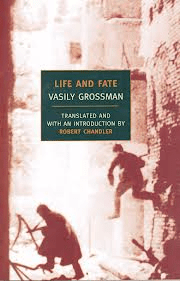 Unfortunately, the novel’s own life and fate were different than Grossman’s, who had died in 1964 not knowing that the book would prevail over all its enemies. Life and Fate, in Robert Chandler’s translation, is about 850 pages. It has somewhere around 150 characters, most of whom are Russian, and therefore often referred to by either a patronymic or an unfamiliar pet name—if you’ve read Dostoyevsky or Tolstoy, you’ll know what I’m talking about. The setting is equally vast—though taking place largely in the period of the Battle of Stalingrad, which lasted from August of 1942 until February of 1943, it travels to Russian work camps and German concentration camps, various Russian cities and even the Russian steppes. These obstacles may make it at first appear daunting. But there is a comprehensive character list, grouping people by setting, and once you know that, you will never be as lost as all that. I say this all at the outset not to put you off but to fortify you for the journey, because Life and Fate is a great work and one that’s worth your time and effort despite its difficulties. Grossman was fated to be a person who was present at a historically decisive moment in history, not only as a war reporter who chronicled some of the biggest battles of World War II, but also as a Jew who witnessed the horror of anti-Semitism under two lethal regimes. According to Chandler, he was the first person to publish an account of a Nazi death camp in any language. Moreover, Grossman knew what it was like to live under a totalitarian system and to move from initial loyalty to it to criticism of it. He chronicled the many ways people try to accommodate themselves to a fundamentally antihuman system. He has something to tell us about what our human life is about: what courage is, and cowardice, and how susceptible we all are to intimidation, flattery, jealousy, pettiness; how even small moments of weakness can lead to great ethical failures under a system designed to use people against each other. Grossman was courageous beyond ordinary courage and yet he too signed a letter he shouldn’t have, calling for harsh punishment for Jewish doctors under Stalinism. But one of the achievements of this book is to show how both bravery and weakness exist in all of us, and to teach us how to go on after our all too human lapses.